Herbed Israeli Couscous | Time to Cook! I love this simple and versatile side dish. 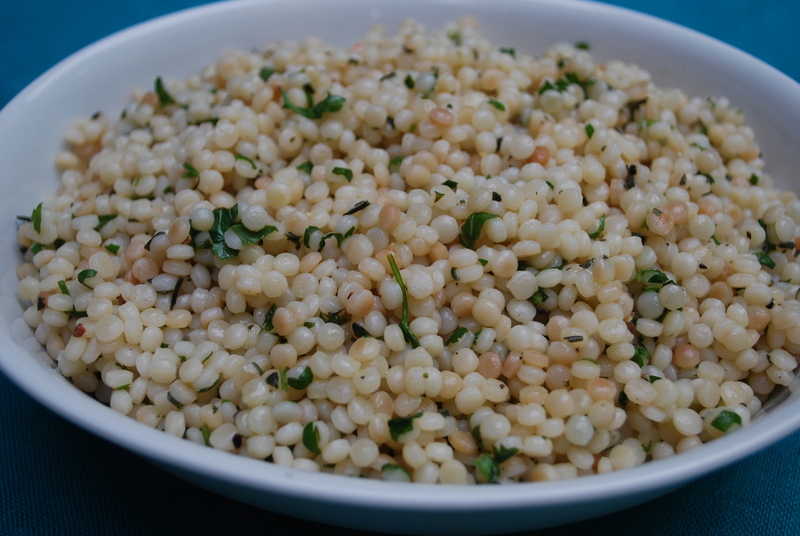 The texture of Israeli couscous is fun and the fresh herbs make it beautiful and tasty. I’m not a big fan of tarragon, so I substitute with sage (since I grow it). If your couscous is at all sticky (mine was), just add another drizzle of olive oil and work through it w/ a spoon, breaking up any clumps. This can be served warm or at room temperature. Recipe from The Culinary Institute of America’s Gourmet Meals in Minutes. Heat the olive oil in 2-quart saucepan over medium heat. Add the couscous and sauté, stirring constantly, until well coated and aromatic, about 2-3 minutes. Add the broth and bring to a boil. Reduce heat to medium-low and simmer until just tender, about 10-12 minutes. Add the herbs and lemon juice. Season with salt and pepper.